Oh, dear. Where to start? Especially when this particular book (and the whole New 52) has become, for so many people, something bigger than comics itself. Even DC realizes that this… whatever it is (Initiative? Event? Reboot? Circus Freak Show?) has become so over-hyped that there was some effort recently trying to walk everything back a little. In the recent ICv2 interview, Dan DiDio actually admitted that they have no clue where they’ll be in six months. Here, walking backwards may be prudent. Because you know what happens when you try to cook something in a pot that is too hot? Everything sticks to the sides, and the pot (and meal) is ruined. So, let’s just start with the comic book, shall we? 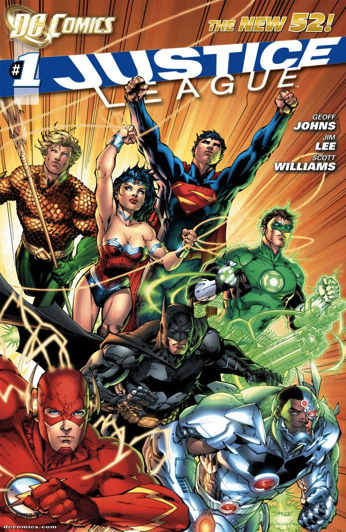 I’m not sure that a comic with only two lead characters (okay, there was a last-page cameo of a third, and an origin set up for another) can actually be called a Justice League book. While Batman and Green Lantern are immensely popular, two people am not a League. Obviously, this story is going to be a multi-part origin, and it may ultimately read great after it’s collected, but I have to look at only what I am given here — and I am (for now) unsatisfied. I’d love to say more about Geoff Johns’ story. Except there isn’t a story here. It’s just an outline. And not even a complete outline. It’s just a fragment. As a fragment, it’s not bad. But it’s not enough. One thing I did like was the brief appearance of Victor Stone to set up his origin as Cyborg. DC’s been trying for years to force Cyborg into the ranks of the JLA, but fans have never warmed up to the idea, since for many long-time readers, the character is so closely identified with the New Teen Titans — historically, one of DC’s most popular and beloved series. By retelling Vic’s origins and tying them into the new JL series, DC stands a much better chance of getting fans to think that the character “belongs” with the JLA — especially the new readers that DC’s trying to court with this particular publishing relaunch. It should be noted that this entire story is set “Five Years Ago”, indicating that what we are reading is very early in the new, revised, “everything happened within five years” DC timeline. As someone who was once active in helping to maintain that timeline, I will be very interested to see how DC will deal with the “problem” characters of the old timeline, i.e. the characters who obviously aged during the stories, like the Teen Titans and other youthful characters/sidekicks, as opposed to the characters who didn’t age (or didn’t age much — like Superman, Batman, and many of the other key adult characters). Unfortunately, part of the problem with launching this JL “flashback” story the same week as its supposed “setup” issue is that if you got excited by the prospect of the new DC Universe hinted at in Flashpoint #5, you were most likely disappointed by not immediately seeing a corresponding current-day story in Justice League #1. (I was.) To see more of the current-day DCU, we’ll have to wait another week. I’m even more depressed that we’ll have to wait another several months (it appears) before we see a current-time JL story. It seems odd to me that we will see current stories of the secondary JL teams (International and Dark) long before we see a current adventure of the real deal. The biggest revolution in comics over the past several years is due to the industry breeding smarter fans. And that may not be in the company’s best interests. A lot of smart fans are going to look at JL #1 for what it appears to be — a template for a movie, or an animated feature, or a video game, or a motion comic, or anything other than just a comic book. They’ll also realize that what they’ve been given here is just a slice of a complete story. So, smart fans — who will (and maybe already have, except the publishers refuse to acknowledge this) eventually tire of buying everything multiple times — may just use the New DC as an excuse to finally stop reading. Oh, wait, they won’t stop reading — if you know what I mean, nudge nudge — but they may stop buying, instead waiting for the inevitable collection. Or movie. Or video game. If publishers were smart, they would use moderately priced digital copies as loss leaders toward the eventual sale of a nice, permanent collection. But then they run the risk of alienating their network of Direct Sales comic book retailers, something else which may also be inevitable. To take this to unfortunate meta levels, JL #1 has landed as the poster boy test case for everything that has been collapsing around the comics medium for the last several years — the massive erosion of comics sales; digital issues, both legal and illegal; horrible storytelling/packaging decisions (such as decompressed storytelling); price vs. format; increased corporate influence in comics; the old boys’ network. Got an ax to grind? Now’s the time to do it, it appears. Perhaps that’s unfair, but DC wanted the spotlight, and now they’ve got it. You know that old adage about there not being any bad publicity? I think that the New 52 has become an unfortunate laboratory for testing that. And remember my pot allusion up top? Maybe it’s finally time for publishers (not just DC) to either [you know] or get off it. They have to decide if they’re periodical, graphic novel, or digital publishers, or come up with a workable plan to combine all three — without angering their fans and retailers. While they still have an audience who cares. Other, non-superhero publishers have already done this. Top Shelf serializes some of its comics on its website; so does First Second. SLG Publishing was the first to sell digital download copies. It’s understandable that a bigger company wouldn’t be a first mover, but they should pay more attention to some of what their smaller, more nimble compatriots are doing. Bottom of the Ninth? Or Game One of a Double-Header? So bottom line, the comic itself: Fun, but not enough story for 24 pages (and $3.99). So not the grand slam DC was hoping for. (Um, if you want a grand slam, you need to put people on base first.) This was more like a bunt. A flashy, pretty bunt, but a bunt nonetheless. It might ultimately turn into a grand slam, but are fans willing to wait a few more months to find out? Welcome to the New DC. I think its going to be a while before everybody realizes exactly what that means. Including the New DC. More next week.